Gradually whisk the lager into the flour with the chilli powder – add enough beer to make a batter the consistency of pouring custard. Season to taste. To make the tartare sauce, mix all the ingredients together, taste and season. Heat the oil to 190°C, or until a drop of batter rises to the top and sizzles. 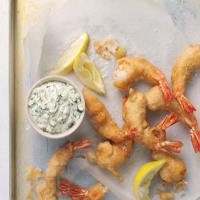 Toss the prawns in a little flour, then, holding each by the tail, dip in the batter, shake off the excess and drop them carefully into the hot oil. Cook about four at a time so the temperature of the oil does not drop. Fry them for no more than 2 minutes, after which they will be golden, crisp and perfectly cooked inside. Drain well on lots of kitchen paper and sprinkle with salt. Serve with the lemon wedges and tartare sauce in pots for dipping. into the juicy prawns in their golden overcoats.